Archival Quality Fine Art Giclee Print with Embossed Seal of Authenticity- Double Matted and Quality Framed - Extra Large Image Size 27"x35" - Outer Frame Size 35"x44". Also available on Canvas, Other Sizes, and Greeting Card. VERY IMPORTANT: All Prints Images are available PRE-FRAMED using quality materials and ready to hang. OUR FRAMING which makes the overall cost more affordable to you, protects the work during shipping and handling, and makes it immediately ready for enjoyment. Our standard frame is designed to enhance any decorative motif. Custom framing available on request. Prints have an Embossed Seal of Authenticity and Certificate. Giant sized Custom prints Contact us for Information. Custom Framing Available. Contact us for Information. *All sizes are approximate. Prices subject to change. 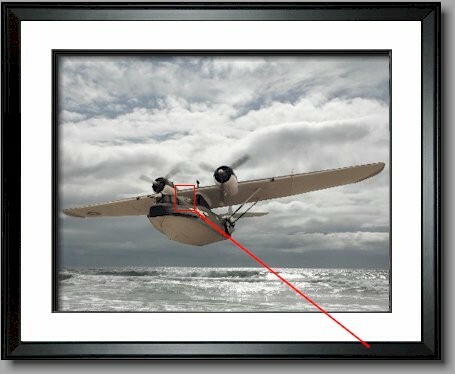 The PBY-5A Catalina Flying Boat Patrol-bomber flying boat played an instrumental role throughout World War II. Even though it was slow and vulnerable its long range and versatility enabled it to perform many types of critical missions including Bomber, Air-Sea Rescue, Scout, Anti-Submarine, Patrol, Transport, and Night Attack in the guise of the famed "Black Cats". The Catalina was designed by Consolidated Aviation and first flew in 1935. Among its feats was locating the German Battleship Bismarck which led to its sinking, and spotting the Japanese fleet at the critical Battle of Midway. Thousands of Airmen and Sailors owe their lives to being rescued at sea by the famed PBY. This image is dedicated to the courage and daring of the unsung Men and Woman of the military who perform often unglamorous and thankless tasks but without which battles are lost and triumph turns to defeat. Check out these other images. Click on image to ENLARGE and for details. Pure Sentiments: Remembering, Reminding and Reveling. © 2001-2004 Diokei. All rights reserved. All Artwork and other Images are Copyright Protected.